How Do You Pronounce That? 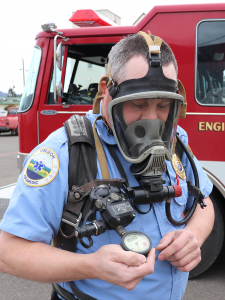 Assistant Fire Chief Willy Burris demonstrates a “self-contained breathing apparatus” used by Myrtle Point firefighters. The equipment shows evidence of hard use, and it is increasingly unreliable. MYRTLE POINT – Fighting fires is dangerous twice. Obviously, plunging into a burning building is risky. But as it turns out, the danger doesn’t stop when firefighters return to the station. s are at super high risk for cancer,” said Willy Burris, Myrtle Point’s assistant fire chief. Burris, Chief Daniel Gardner and the volunteers on Myrtle Point’s fire crew can breathe a little easier – literally – with help from a $6,000 grant from the Coquille Tribal Community Fund. The grant will help replace the department’s aging protective gear. A “self-contained breathing apparatus” – a backpack-mounted air tank and mask – protects a firefighter’s life on the job, while reducing long-term effects of toxic smoke. But Myrtle Point’s battered equipment no longer inspires confidence. “It’s in the back of your mind: I hope this thing doesn’t fail,” Burris said. The department’s 15-year-old air tanks are hitting their legal expiration dates, and the accompanying gear is increasingly temperamental. A tiny malfunction can make exhaling difficult, and replacement parts are hard to find. Some volunteers are reluctant to wear the gear, despite its life-saving importance. “Any time you’re breathing smoke, you need to wear your mask,” Burris said. In a study completed in 2015, the National Institute for Occupational Safety and Health found increased incidence of cancer diagnoses and cancer deaths among firefighters. Digestive, oral, respiratory and urinary cancers were the most common. Firefighters also were susceptible to malignant mesothelioma, a rare cancer caused by asbestos exposure. Burris notes that today’s buildings are full of synthetic materials that produce toxic substances when burned, including cyanide. Fire departments nationwide have been advised to clean their turnout gear after each fire to remove hazardous residue. Myrtle Point’s new breathing apparatus will feature straps that can be removed easily for laundering. It also features a more comfortable design than the old gear. Burris said the department studied what’s on the market and chose a relatively basic model rather than a more deluxe setup. “There’s less stuff to go wrong,” he explained. Myrtle Point’s $6,000 public safety grant is one of six awarded by the Coquille Tribal Community Fund this year. Public safety accounts for $37,000 of the tribe’s more than $290,000 in 2018 grants. Tribal member Jackie Chambers, who coordinates the Community Fund, said the Coquille Tribe is pleased to be able to help Myrtle Point’s volunteer heroes. Tribal Members: Click here for details about programs and services.